If you’ve visited this webpage in the past, you’ve probably figured out that I’m an amateur historian and love to dig up as much background information as I can on my telegraph instruments. A recent example of this is the discovery of the obituary for Rolf Brown, the maker of the “XOGRAPH” bug in Toronto, Canada up until the early 20’s. That got me thinking about some of the other makers who were producing Vibroplex bug clones in the early part of the 20th century. So I kicked off a research project on Max Levey, owner of the AtoZ Electric Novelty Company which produced the “Improved Vibroplex” bug up until being ordered to stop by injunction in 1914. Prior to this research, virtually no information had been collected on Max Levey beyond the fact that he operated the ATOZ company. In fact, many sites spell is name incorrectly as ‘Max Levy’. As you will see below, Mr Levey has a very interesting history! I hope you enjoy the journey…. Max Levey was a long time major player in the world of early film distribution. He started in the business in 1905 by purchasing the Ohio rights of a silent film. Later he started distributing silent films to various play houses in the Chicago area. He remained active in the industry for decades at numerous companies, eventually becoming a king-pin in the burgeoning home film industry. He was president of the Excel Projector Corporation (reference: MadeInChicagoMuseum.com) which produced 16mm movie projectors for home use. A sly business man, he figured out that his projector customers wanted quality professionally produced films to watch at home. That lead to movie products such as “News of the World” reels which presented late breaking news events from all over the world. This lasted until the television negatively impacted the home film industry after World War 2. 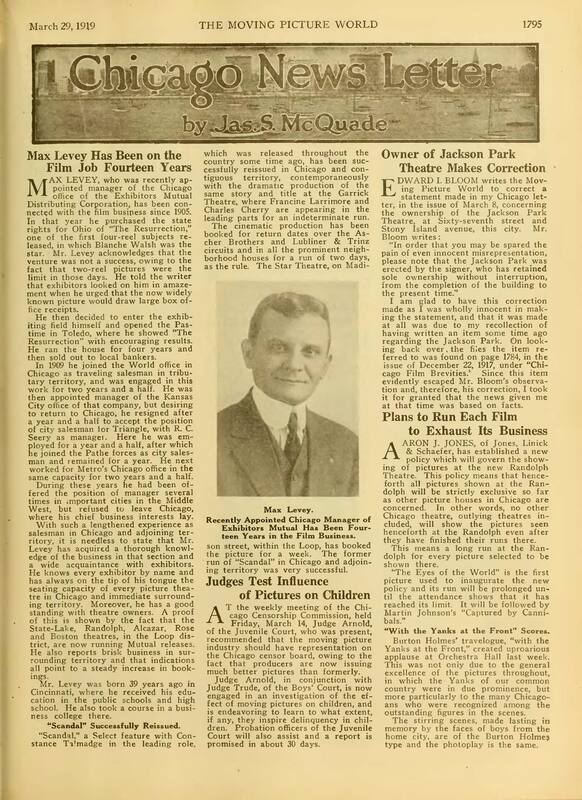 Click on Max Levey’s image above to see an article in the March 29th 1919 edition of “The Moving Picture World”, Chicago news section. I also found the funny telegraph related snippet above in the June 4th, 1920 edition of the “Exhibitors Herald”. The image shows Max set up at his movie distribution office with his own direct telegraph link to his shipping office building. Still, I’m left wondering where Max Levey got his telegraph experience. There is a Max Levey who was the Postal Telegraph Company office manager in Muskogee, Indian Territory (Oklahoma) in 1905. But I can find no direct link between this Max Levey and the Max Levey who was the Chicago film distributor. Then there’s the oddity that the AtoZ Electric Novelty Co never produced anything other than semiautomatic bugs: The “Improved Vibroplex” based off the Original model; a rare double lever, and a bug called an ‘Oscilloplex’. Definitely not the all inclusive “A to Z”. Research continues…. After more research, I can now say with very high certainty that the Max Levey that was the manager of the Postal Telegraph Company in Muskogee, Indian Territory (future Oklahoma) in 1905 mentioned at the end of my last post is the same Max Levey involved in the Chicago film distribution business. The cartoon above adorns the front page of the April 18th, 1905 edition of the Muskogee Daily Phoenix along with a small article. Click on the cartoon to see the entire article. The article provides a very good history of Max Levey’s career, and mentions he was a Telegraph Operator for William Randolph Hearst in Chicago, and also the youngest manager employed by the Postal Telegraph Company. In addition, the place and date of birth mentioned in the article match the information contained in the 1919 “The Moving Picture World” article linked below. I also think the pictured face in the cartoon is a very good match for the images of Max 14 years later shown below. What puzzled me is how someone gainfully employed as a telegrapher in mid 1905 could end up later the same year entering the movie house business in Toledo, OH. The answer came in the June 14, 1905 edition of the Muskogee Times Democrat newspaper. The article above states that Max Levey lost his job with the Postal Telegraph Company due to shortages in his accounts. The article goes on to say that Mr. Levey, who frequented the local pool room and ‘played the ponies quite heavy’, had left town for Topeka, KS. It’s not too far fetched to believe that Mr. Levey sought his fortune elsewhere having been thrown out of his telegraph position. And that somehow landed him in Toledo, OH, opening the first movie house there with exclusive Ohio rights to the film “The Resurrection” (see ‘The Moving Picture World’ article below). I have found a few more earlier 1905 references to Max Levey in Muskogee, Indian Territory. First from the January 7th, 1905 Muskogee Daily Phoenix indicating Levey’s arrival in the city from Joplin, MO to take up the position of Manager of the Postal Telegraph office. Second, from the January 27th edition of the Muskogee Daily Phoenix, a more lengthy article that describes the rapid expansion of telegraph services in the city under Levey’s direction. (middle image) Click on the image to see the full front page from January 27th, 1905. Third, an article from February 4th, 1905 Muskogee Daily Phoenix describing the new Postal Telegraph Office. So it turns out Max Levey was in Muskogee just over 6 months before being run out of town (or escaping town) due to his embezzlement of Postal Telegraph funds to pay for his gambling! Finally, one more article showed up from the June 4th, 1921 edition of “Exhibitors Herald”, Chicago Trade Events page describing Levey’s reissue of Charlie Chaplin 2-reel movies. 1905-1909: Opened the “Passtime” movie house in Toledo, OH to show “The Resurrection” film. Sold the house to bankers. December 22, 1913: Levey goes to Federal District Court for infringing on the patents of Mecograph / Martin / Vibroplex telegraph keys. At the time Max Levey was operator of the AtoZ Electric Novelty Company, which was producing clone versions of the Vibroplex Original semi-automatic telegraph key. The AtoZ key label even boasted “Improved Vibroplex”. It’s not known how long the AtoZ Company existed or how long these keys were produced prior to the injunction. March 14, 1914: Federal Injunction granted against Max Levey as operator of the AtoZ Electric Novelty Company for infringing on the patents of Mecograph / Martin Vibroplex telegraph keys. There’s little information about the AtoZ company and Max Levey’s ownership. We can only surmize this was a side venture that he had going on while involved in the movie distribution business. Max married and divorced Elizabeth “Lizzie” Levey – no children. Elizabeth was also in the movie distribution business. Max’s selective service cards from WWI and WWII indicate he was 5’4″ tall and had his right leg amputated below the knee. It has been an interesting journey to discover exactly who Max Levey was, and what he was doing before, during and after he produced the ATOZ Electric Novelty Company ‘Improved Vibroplex’ clones. Max Levey – An interesting figure in Telegraph History, no-longer lost in obscurity! I hope you have enjoyed this journey. Your feedback is very welcome! Great Job of reasearch Paul, many thanks to share this info with all people. Very interesting to know the history of old factorys that produce early semiautomatics key. Al best de Claudio iz0krc.